Highest eCPM in the industry – our machine learning and optimization engine, together with our direct demand advertisers and our demand partners, generates the highest eCPM in the market. Global coverage and scale – we have world-wide coverage. Over 1.5 Billion daily impression, allowing us to support publishers on any scale. Dedicated account managers and support – we take our publishers very seriously and always put our customers in the center of the company. Flexible payment terms - we know that servers cost money so if you need help with the cash flow, we can help. Advanced solutions such as Anti-Adblock, Chrome compliant products, native push, android apps, players solution and more. One stop shop for many monetization solutions, including pop up, pop under, interstitial, push notification and many more. Control – the only system in the industry that lets you configure multiple parameters and cups for your ads. Easy to setup – the system is very easy to use, you can register and go live in minutes. 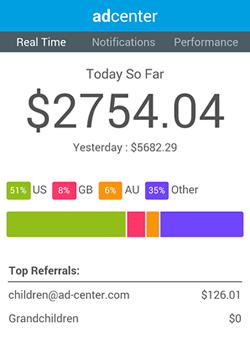 Advanced reports – get detailed reports about your earnings.